Sometimes you may need a change in your home and the living room is a good place to start. If you aren’t sure where to start, then you can consider the modern minimalist style as it looks simply beautiful and is really easy to do. Here are some great styles to get you inspired. Even if you don’t have much space to work with, this style is versatile and can be used for almost any size living room you have. Go for neutral, muted colours in the living room but add some interesting elements such as geometric prints and a subtle pop of colour. This style is also great if you are going for a masculine look as it has many of the elements inside. This living room is a good example especially if you don’t want much clutter in your home. Although there is only one sofa inside, it still looks pretty comfy thanks to the soft textures used. Going all white for your living room’s decor is actually a pretty easy way to be modern minimalist and everything will be so much easier to match. If you are afraid it will look too bland, you can add little splashes of black to make it look more attention grabbing. Sometimes a modern and minimalist living room can look rather sparse and give off the impression that it can look rather unwelcoming. Counter this by decorating your living room with some soft and fluffy textures to make it look more warm and comfy. If you have a big enough living room then you could try this concept out for yourself, by creating a sunken space in the middle of your living room for your sofas. It creates a cosy environment that is great for gatherings but you should keep the other decorations with clean and neat lines to allow the space to attract attention. 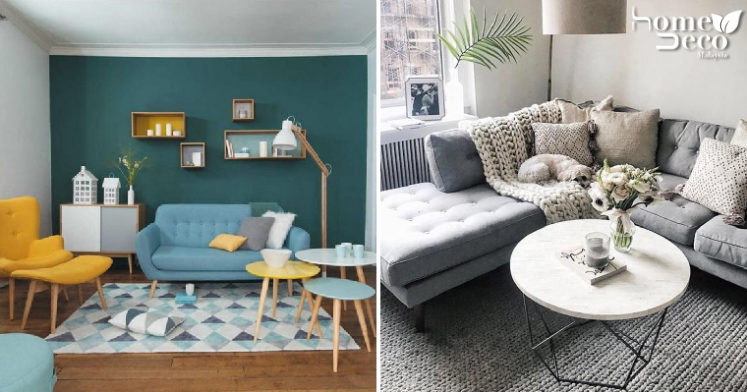 You will be surprised to know that actually, having a colourful palette in your living room can be modern and minimalistic too. Just keep the colours more muted and the lines clean and simple to pull off the look.